Qinghai is often over-looked, its neighbors Tibet and Xinjiang are much better known even though it is part of the same high Tibetan plateau. 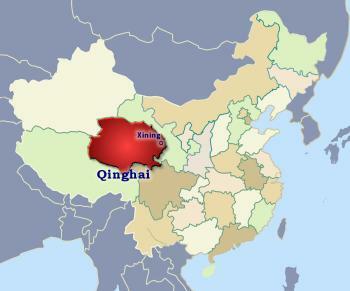 Qinghai is geographically and historically part of the Tibetan kingdom. Before 1928 it was administered as part of Tibet. It is the second least populated province after Tibet. Subject to very low rainfall, cool summers and very cold winters it is not conducive to agriculture and its isolation makes industrial development difficult. The northwest is the driest area; while the central basin Qaidam Pendi ➚ has a harsh desert terrain with salt marshes and intermittent river courses; together this forms the ancient region of Amdo ➚. Except for the eastern portion close to Gansu the province did not come under Chinese control until the Qing dynasty. Qinghai Lake(also known under its Mongolian name as Kokonor /Kukunor) after which the province is named, is the largest lake in China 1,740 sq miles [4,507 sq kms] and the largest saltwater lake in Central Asia. It stands close to the province's north-eastern border; the lake is a haven for birds at Spring time - especially on an island called 鸟岛 niǎo dǎoBird Island ➚. The Lake is at a high altitude 10,500 feet [3,200 meters] and surrounded by good pasture. As a holy site, pilgrims may spend about a month to walk all the way around the lake. Most of the agriculture and limited industry is located near here and so is the provincial capital city Xining. Recently tourism and development has been greatly aided by the completion of the Lanzhou to Lhasa railway ➚ running through the middle of Qinghai. Close to Ledu and the Yellow River is the ancient Qutan Monastery ➚ It was built at the start of the Ming dynasty; the Longguo Dian is its magnificent great hall. Golmud is an oil and transport town on the main railway link from Gansu to Tibet. Bukadaban Feng ➚ is the highest mountain peak (at 22,507 feet [6,860 meters]) in Qinghai on the Qinghai-Xinjiang border. Xining is the provincial capital, located bear the border with Gansu. It has the 14th century Great Mosque ➚ one of the largest in China and built in Chinese style. There is also has the Daoist Bei Shan Temple. Mengda Tian Chi ➚ (Heavenly Lake) is close to the Yellow River 124 miles [200 kms] south east of Xining. It is a Nature reserve and is surrounded by beautiful scenery. The Ta'er or Kumbum Lamasery ➚ is an important center for Tibetan Buddhism located south of Xining. It was the birthplace of Tsongkhapa the founder of the Gelugpa sect ➚ of Tibetan Buddhism and also the birthplace of the present 14th Dalai Lama ➚. Over 650 monks live here. The annual horse festival at Jyekundo ➚ (Yushu) in July is a colorful local event while Gui'de ➚ south of Xining has many fascinating Qing dynasty buildings. There are Tibetan, Mongolian and Hui people together with Han Chinese in the cities scratching a living in the harsh conditions. It is one of the less distinct provinces as it merges into Tibet and Gansu without obvious change and was once part of Greater Tibet. Much of Qinghai Province is poor pasture land for yaks and sheep. The province is the source of both the Yangzi (known in China as Chang Jiang and Tongtian He in its upper reaches) and also the Huang He (Yellow River), the two great rivers of China. 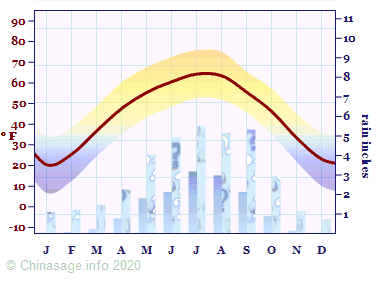 The Mekong river ➚ also rises in the south-east of Qinghai. The area sourcing these three great rivers is designated the Sanjiangyuan ➚ 三江源 Three Rivers National Park. Discovery of oil fields within the province has led to patchy industrial development. Lake Zabuye ➚ is China's main source of the important element Lithium ➚. 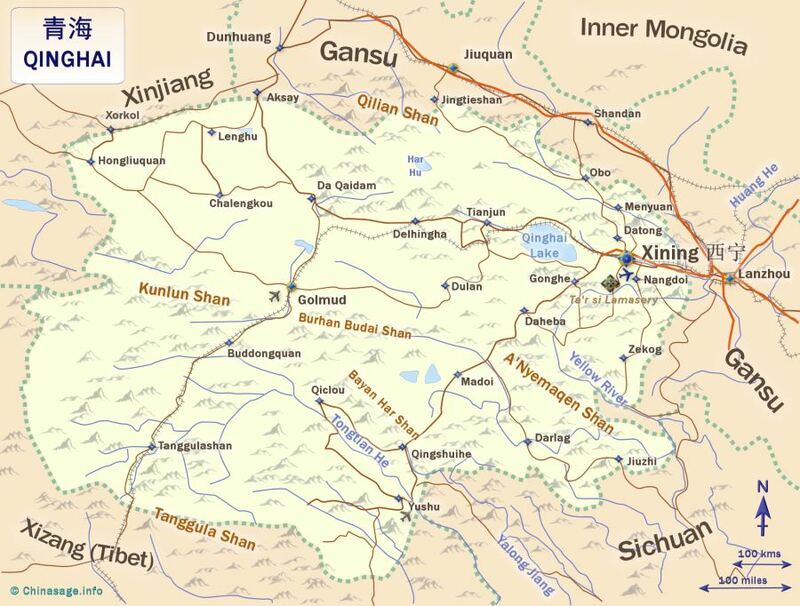 Tanjianshan ➚ near Da Qaidam has an important gold mine. Its desolate nature has made it a suitably remote location to build prison camps for dangerous criminals. Citation information for this page : Chinasage, 'Qinghai, China', last updated 4 Dec 2018, Web, http://www.chinasage.info/maps/qinghai.htm.